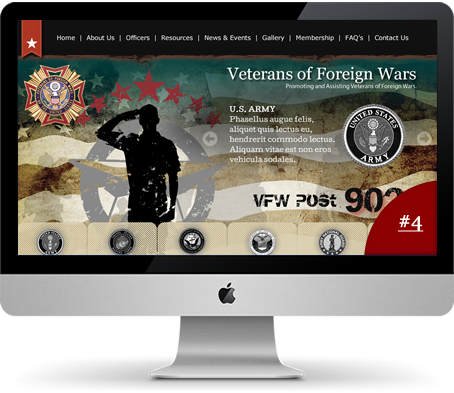 We’re pleased to formally announce the new VFW Website Solution program. First introduced at the Conference in Kansas City, the VFW Website Solution program will assist Posts in establishing a viable, easy-to-manage website. Developed by DrivePath and PIXELBIT, this template-based platform offers Posts an affordable opportunity to stake their claim of the web, making pertinent information easily accessible to members, as well as the public. Further, the website templates being offered adopt a consistent look and feel, working to reinforce the official VFW brand and messaging. Perhaps the most exciting part of this new program is, through Operation Uplink, the VFW is offering your Post a grant to cover everything needed for the first year of service! However, this grant is limited to the first 4,000 Posts to apply. The grant will cover the cost of domain management, development, integration and hosting for the first year. Thereafter, it is the responsibility of the Post to fund the annual domain management and hosting fee of $360. That's less than $1 per day! Plus, the web solution has site sponsor integration that allows local business to pay for future costs, essentially making the VFW Website Solution Program FREE! These websites boast many manager-friendly functions, and feature an "integration" component which allows the national website, and Department and Post websites to share information, both manually and automatically. This includes a system which allows the Posts to efficiently submit reports directly to the Department. And DrivePath and PIXELBIT offer each Post an initial training session on the system and ongoing support. If you have questions you can call David Strange at PIXELBIT directly at 248.232.1293 or go to your account at VFW.org, login, mouse over the "MyVFW" link and select the VFW Website Solution Program link for more information and how to get started. Please discuss adopting the VFW Website Solution Program with your Post Leaders and help us tie all our posts together with the Department.